Cary Grant will forever be one of Hollywood’s brightest stars. But icons rarely come fully formed, and Leo McCarey’s 1937 film was where Grant’s persona finally coalesced after a string of so-so supporting roles. 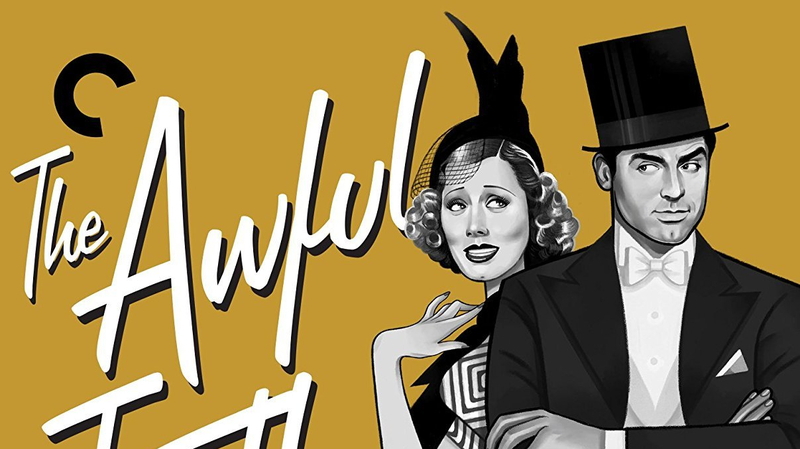 The latest addition to the Criterion Collection, The Awful Truth is the first of Grant’s classic screwball comedies. Jerry Wariner (Grant) and his wife Lucy (Irene Dunne) are serial philanderers. When Jerry returns home from a trip to Florida, he finds Lucy courting her smooth music teacher Armand (Alexander D’Arcy). But a California-stamped orange that Jerry has brought home in a fruit hamper betrays his own lies. The Awful Truth’s modernity is perhaps its most striking quality. The infidelities of its leads are never a source of moral finger-wagging, but rather bring depth and frailty to Jerry and Lucy. Grant’s newly-minted lackadaisical charm doesn’t hurt either, carrying us through his questionable behaviour. Following a swift, clean divorce, Lucy immediately embarks on an ill-advised affair with Oklahoma boy Dan (Ralph Bellamy). Though her Aunt Patsy (Cecil Cunningham) warns her of the perils of “the rebound”, Lucy parades Dan in front of her soon-to-be ex. It doesn’t take a relationship counsellor to see that Jerry and Lucy are still in love with each other, and there’s little doubt that the pair are headed towards their eventual reconciliation. Its plot may be predictable, but The Awful Truth succeeds through its inventive scenarios and a laid-back tone that perfectly matches Grant’s laconic performance. Meanwhile, Dunne exudes a cheeky appeal that is well out of the boyish Dan’s depth. Two set pieces confirm that he is hardly a serious rival for Lucy’s affections. The first, in which Jerry hides behind a door while Dan begs Lucy for a single kiss, is at once charming, inventive and affectionately sad for the guileless Dan. Later, he attempts to serenade her by tunelessly warbling Home on the Range – a perfect summation of their mismatch. It’s easy to laugh at Dan, but the film’s worldliness stops short of outright cynicism, reserving judgement exclusively for the slimy Armand. Second only to the final scene, the film’s most tender sequence comes when Jerry pays the band in a restaurant to keep playing so that he can keep watching Lucy dance, even if it is with Dan. Historically, The Awful Truth is probably most significant as the film that secured Grant’s star, forcing him to adopt his famously relaxed persona through McCarey’s improvisational approach to filming. The film lacks the crackle of Grant’s later masterpieces yet there remains a great deal to enjoy here with an ending that surprises with its tenderness, not-so-subtle eroticism and visual wit. One of the top best online casinos UK says – The Awful Truth is one of the classic, definitive eccentric comedies of the thirties. It’s a pleasure to watch such actors.